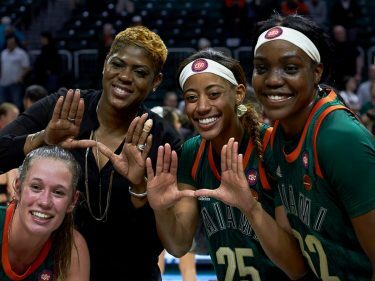 For most programs, winning 44 out of 63 games, dominating the ACC and making the NCAA Tournament would be seen as a season to remember. 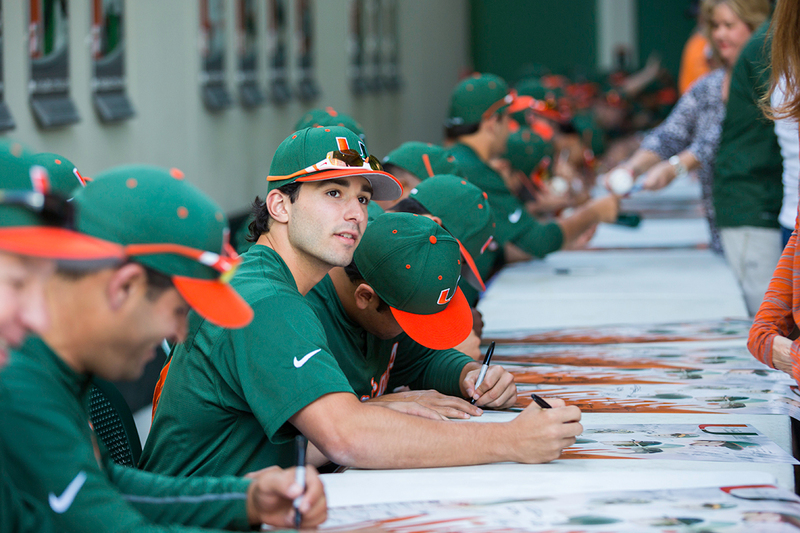 The University of Miami baseball team, however, looks at its accomplishments from last season with regret that the season didn’t end in Omaha. Last year marked the 42nd straight postseason appearance for the program, the longest active streak in any NCAA sport. A potent offense is sure to keep that streak alive. The Hurricanes, ranked No. 10 in Perfect Game’s top 25, kick off their 55-game schedule with a four-game series against Rutgers this weekend. National Freshman of the Year Zack Collins leads the offense after an outstanding debut season in Coral Gables. The sophomore catcher and first baseman placed himself among the best hitters in the nation after hitting .298 while leading the team with 11 home runs. Collins will be joined in the middle of the lineup by sophomore Willie Abreu, a tall, athletic right fielder who hit .277 with eight doubles as a freshman. Junior third baseman David Thompson, who was recognized by Perfect Game as a second-team Freshman All-American in 2013, will look to post a strong season after thoracic outlet syndrome kept him out for 32 games last season. Miami’s rotation has some uncertainty once they get past their ace Andrew Suarez. Suarez was drafted in the second round of the Major League Baseball (MLB) draft but decided to stay in Miami for his senior year. The hard-throwing lefty leads an otherwise inexperienced rotation that lost three pitchers to the draft. Suarez was the highest player drafted to return to school. “It’s huge when you can get your Friday night guy back, especially when he goes that high in the draft, but obviously losing two horses on the mound like Chris Diaz and Bryan Radziewski means that it’s just that much of a shot in the arm and a boost heading into the year for them,” Brown said. Miami’s starters will look to get the ball to closer and preseason All-American Bryan Garcia, a right-handed reliever whose stellar freshman season included a 1.75 earned run average and 15 saves. The inexperienced rotation will have Garcia and an athletic defense to support them. Center fielder Ricky Eusebio is revered by the Miami coaching staff as one of the better defensive outfielders they’ve had. Flanking him in left field will be the highly touted freshman Carl Chester, who looks like the team’s leadoff hitter thanks to his speed and ability to get on base. Eusebio and Chester will try to replace some of the production the Hurricanes lost when Dale Carey left for the MLB. Junior college transfer George Iskendarian is another powerful bat in the lineup. The former University of South Carolina player hit .373 while at Indian River Community College last season. Iskendarian will see time at shortstop and third base, with junior Brandon Lopez getting the majority of the starts at shortstop. 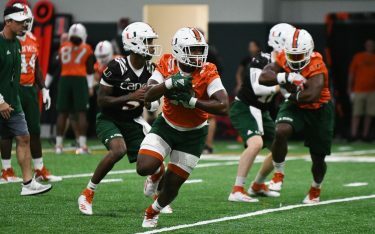 Lopez, one of many Miami natives on the roster, was a highly touted recruit in high school and is a rangy and sure-handed fielder. The biggest challenge for Miami in the always-tough ACC will be Virginia. 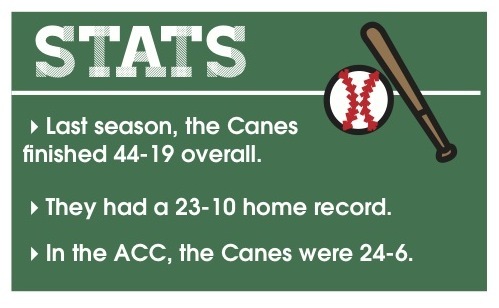 Perfect Game projected them as the winner of the ACC’s Coastal Conference, and they return plenty of key players from last season’s runner-up finish in the College World Series. The new season features new baseballs that are geared toward offense, so much so that Morris said he saw more balls leave the park in one day of batting practice this fall than all of last year. The Canes, with an offense that could capitalize on the new balls, will again be a contender for the top spot in college baseball.